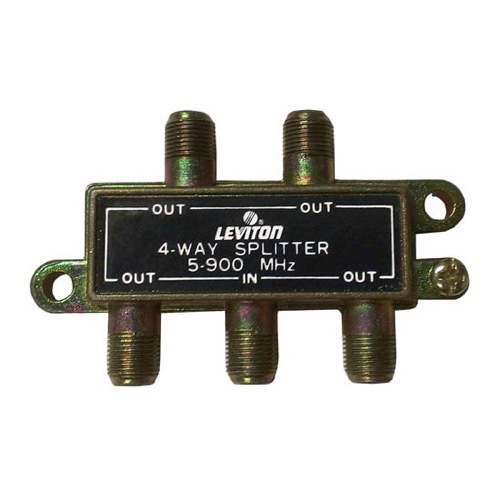 Sends a 75-Ohm signal from antenna or cable / pay TV to four TV's and / or VCR's, simultaneously. Sold as singles. Tools: Screwdriver to mount splitter. Plug 75-ohm coaxial cable from antenna or cable / pay TV into jack marked 7 dB on Splitter. Plug 75-ohm coaxial cable from TV 1 to any jack marked 7 dB on Splitter. Plug other end of cable into VHF jack on TV. Repeat step 2 to connect remaining TV's and / or VCR's into remaining 7 dB jacks on Splitter.